Dutch flyfisherman and flytier, Hans Van Klinken, came up with this pattern in 1984 along the Glomma River in Norway. He noticed that most of the graylings were being caught with dry flies that were weighted to sink into the surface film. 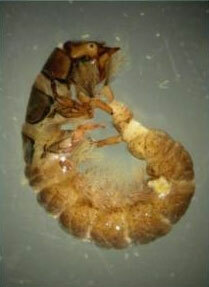 Upon examining one of the graylings, Hans also noted the abundance of large curved caddis larvae within the stomach contents. These observations led Hans to tie a caddis larvae pattern onto a scud hook and submerge the pattern into the surface film by using a parachute hackle and floatable wingpost. He called his pattern L.T. Caddis (L.T. for Light Tan) but later, friends started using the name Klinkhamer Special and the name stuck. It came to the attention of Sierran Flyfishmen during the early 2000's through a number of articles examining the pattern. Recently, the pattern has seen a resurgence in interest, since Partridge introduced their Klinkhamer hook and the hooks became locally available. The pattern is designed to be used as an emerger dry (if you have difficulty locating these hooks, try substituting a TMC 200R and put a 30 degree bend about 1/3 from the eye along the shank). Although originally tied as an emerging caddis larvae, the pattern can also be adapted to many of our mayfly emergers as well. The Klinkhamer has a very visible wingpost made of floatable yarn that allows the flyfisherman to see the fly easily. The hook design allows the pattern to lie deep within the surface film and is very stable due the heavy parachute hackle wound above the thorax. 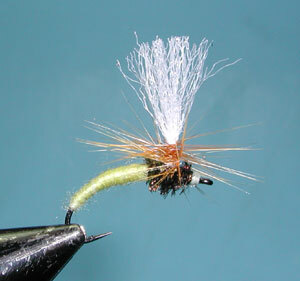 Hans has had over 20 years to refine this pattern and has come up with the following points with regard to the materials one chooses to tie this fly. Hackle: Use a high-quality hackle with stiff fibers. Apply at least 5 wraps on sizes 16-18 and 8 wraps on sizes 10-14. 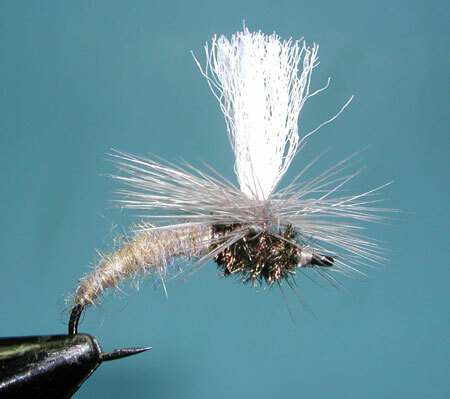 The hackle can be oversized and kept hoizontal to achieve good floatation. Wing: Use a floatable poly yarn for the wingpost. It can be of any color you please, to sight the most easily. Hans prefers Niche Silcon Yarn for size 16 and smaller. The wing should be long, about the length of the hook shank. Abdomen: Hans prefers Extra Fine Poly Fly Rite Dubbing for sizes 14 or larger, and Wapsi Superfine for size 16 or smaller. The important thing is to apply the dubbing sparsely. You want a thin body. Thorax: The thorax should be much larger than the abdomen. Hans uses 3 strands of peacock herl but also suggests Peacock-colored dubbing as a substitute. Hook: Originally the pattern was tied on a Partridge Yorkshire Caddis hook. Partridge designed a better hook style from Hans input, the 15BN and 15BNX. These hooks give the proper wide gape and have a straight eye that allows the hook to hang vertically in the water column. Hans also came up with an easier technique to tie the parachute hackle using Spiderweb thread. The tie off is around the wingpost at the base where it is protected by the wing material from getting ripped open by the trout's teeth. This is a marked improvement from typically tying the hackle off just behind the eye. 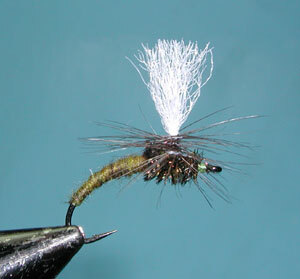 There is an excellent article on Klinkhamer flies written by Hans on the Rackelhanen website: Klinkhamer Flies.